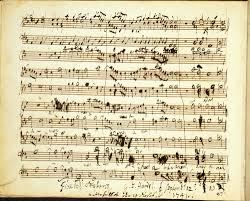 The magnificent arcs of Handel’s music have made these words particularly memorable for a lot of people. Supported by an orchestra which both echoes them and lets them ring out clearly, they sound like an address to the listening congregation, or audience, offering comfort at a time of year which can be equally joyful and trying. For some that comfort will be spiritual, and for some aesthetic, and both come as a reminder of the realities beyond shopping and meal planning. Though of course, the text doesn’t actually say that, and it all hangs on a comma and the grammatical quibble which goes with it. The text Handel set is from the Authorized Version (or King James Bible), which renders the beginning of Isaiah 40 as “Comfort ye, comfort ye my people, saith your God”. As many people reading this will know, the shifts in English grammar since the Authorized Version appeared mean that modern readers are liable to mix up the grammatical implications of the line. When this line is taken out of context (and set so beautifully, as in Handel’s Messiah) it sounds as if God is saying “Comfort yourselves”, to the people. In fact the line is addressed to Isaiah himself, so a more modern rendering might run “You, go and comfort my people”, and later versions often print it as simply “Comfort my people”. As we discussed a couple of days ago, identifying someone as “a voice” is an odd matter. John has something of the quality discovered in the “reordberend”, presenting himself as a voice which responds to God’s creative act and gestures away from the speaker towards God again. He does not call himself “the one whose voice is crying in the wilderness” but “the voice of one crying in the wilderness”, fitting with John’s insistence in this chapter that he doesn’t matter, that his value is what he can direct other people’s eyes and lives towards. Unlike Jesus, in his account he is not both sign and signified, but just the sign. This version chooses a different reading, placing the punctuation between the speaker and the wilderness. In the original, lacking punctuation, it would be unclear whether the voice was crying in the wilderness or crying out that in the wilderness a way should be prepared. Though this is less close to what John the Baptist says, I think it makes more sense of his proclamation. John’s enigmatic reply to the priests and Levites does not simply identify him with a figure – or rather, a voice – from the Isaianic prophecies, but creatively rereads those prophecies. The urban prophet had apparently heard a voice which ordered the preparation of a road in the deserts, and that voice’s words had been kept and studied by his prophetic school. Centuries later, a holy man was attracting attention in the wilderness beyond the Jordan, and the priests and Levites came to question him as to his identity. Refusing to give himself a title or a full name, he recited the prophecy, but did so in a way which altered their meaning. The voice which the prophet had heard in Jerusalem was itself in the wilderness, and it was from the wilderness that the call to repentance was being made. It’s a grammatical quibble, but one which is rather characteristic of both Christian and Rabbinic thinking. Read one way, the prophet in the city had been told to civilize the wild land beyond the city, but read another way, the desert was calling out to the city to “repent and believe”. The sermon I heard this morning from Mother Judith Brown stressed the theological depth of “the wilderness” as both a psychological metaphor and a major theme in Israel’s history. It was in the wilderness that God appeared as cloud and fire, that God fed the people with manna, and that God gave the Law to Moses. Jesus would go into the wilderness for a period of fasting and prayer which is described as “forty days and forty nights” to parallel Israel’s wanderings. John’s answer is both a pedantic grammatical clench and a profound spiritual challenge. In his demand that the people “repent” we can hear the literal meaning of teshuvah, “to return”. He asks the Levites to return to the Scriptures to find a meaning they had missed, and asks his own followers to return to the wilderness where God had sheltered Israel. It is, in many ways, a very dry pun.